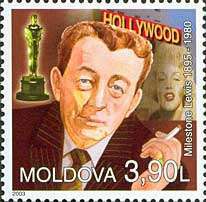 Lewis Milestone (born Leib Milstein; September 30, 1895 – September 25, 1980) was a Moldovan-born American motion picture director. He is known for directing Two Arabian Knights (1927) and All Quiet on the Western Front (1930), both of which received Academy Awards for Best Director. He also directed The Front Page (1931 – nomination), The General Died at Dawn (1936), Of Mice and Men (1939), Ocean's 11 (1960), and received the directing credit for Mutiny on the Bounty (1962), though Marlon Brando largely appropriated his responsibilities during its production. Milestone was born in Kishinev, in the Bessarabia Governorate of the Russian Empire (now Chişinău, Moldova), to a family of Jewish heritage. He came to the United States in 1912, just prior to World War I. Milestone held a number of odd jobs before enlisting in the U.S. Signal Corps, where he worked as an assistant director on Army training films during the war. In 1919 he became a naturalized citizen of the United States. After the war he went to Hollywood, where he first worked as a film cutter, and later as an assistant director. Howard Hughes promoted Milestone to director and one of his early efforts, the 1928 film Two Arabian Knights, won him an Oscar in the first Academy Award ceremony. He also directed The Racket, an early gangster film, and later helped Hughes direct scenes for his aviation saga Hell's Angels (for which he never received credit). Milestone won his second Academy Award for All Quiet on the Western Front, a harrowing screen adaptation of the antiwar novel by Erich Maria Remarque. His next, The Front Page, brought the Ben Hecht/Charles MacArthur play to the screen. In the Front Page Milestone was one of the first directors to use the rotoambulator. The rotoambulator is a combination of a crane and a dolly with three wheels. The rotoambulator was effectively used in the scene of the Front Page where Walter Bums descends to the shipping area of his plant. The rotoambulator was used to capture the entire scene in a way that had never been done before. It earned him another Oscar nomination. His work during the 1930s and 1940s was always easily identifiable by its lighting and imaginative use of fluid camera. During this time, he made the original Of Mice and Men. Then in the war years Milestone made The North Star, The Purple Heart, and A Walk in the Sun, movies made during and set in World War II. In these films, he defended the world's fighting both Nazi Germany and Imperial Japan. After the war, he was blacklisted under the suspicion that he was a communist sympathizer. Deciding to wait for anti-communist hostility to cool, he and his wife left for Europe: here he made a few films. In the U.S., he made other films before leaving for Europe, but his postwar films did not have the same power as the early works. He worked extensively in television from the mid-1950s on. He returned to the U.S. to make two more films: Ocean's 11 starring the Rat Pack including Frank Sinatra and Dean Martin, and Mutiny on the Bounty starring Marlon Brando. The original 'Ocean's 11' worked, but 'Bounty' became a box office bomb. With no other work to do, he turned to TV work which he disliked, then left directing as his health began failing. Milestone died from natural causes on September 25, 1980, five days short of his 85th birthday. Lewis Milestone's final request before he died in 1980 was for Universal Studios to restore All Quiet on the Western Front to its original length. That request would eventually be granted nearly two decades later by Universal and other film preservation companies, and this restored version is what is widely seen today on television and home video. Milestone is interred in the Westwood Village Memorial Park Cemetery in Los Angeles. ↑ U.S. Census, 1930, State of California, County of Los Angeles, enumeration district 825, p. 21-B, family 587. ↑ ""Kangaroo" producer is coming here by camp trailer.". The Mail. Adelaide: National Library of Australia. October 14, 1950. p. 2 Supplement: Sunday Magazine. Retrieved March 25, 2012.